Nearly 1,000 species of bees occur in the Pacific Northwest, but only a small number of species are useful in the pollination of orchard crops. Pesticide use and loss of appropriate nesting habitat have reduced the numbers of wild bee pollinators, leaving most of the pollination for commercial orchards dependent on honeybees. The success of honeybee pollination in tree fruits is affected by a number of factors, which in part can be manipulated by orchardists and beekeepers. At any given time approximately one-third of the honeybees in a colony are searching, or foraging, for nectar or pollen. Foraging bees rarely collect both nectar and pollen during the same flight. About 50% of the honeybees foraging in Red Delicious apples are pollen collectors, but that number may increase in other varieties. Roughly 80% of the honeybee foragers in cherry orchards are collecting pollen. Because pollen collectors pollinate fruit trees more efficiently than nectar collectors, orchardists prefer colonies with a higher percentage of pollen collectors. Larger colonies, with large amounts of brood (immatures) tend to send out a greater proportion of pollen collectors than small colonies. The relative percentage of honey bees foraging apple at different temperatures. Honeybee flight is affected by weather conditions. Few bees will fly at temperatures below 55°F. Honeybees don't forage in full force until temperatures are above 65°F and winds are less than 10 miles per hour. Winds greaterthan 15 miles per hour will slow or altogether stop foraging behavior. If light intensities fall below about 60,000 lux it will also reduce foraging behavior (an overcast day has around 10,000 lux, and unobstructed sunlight has an intensity of approximately 100,000 lux). The field force or actual number of bees working the fruit bloom is critical information. You can determine the field force in an orchard by slowly moving around an individual tree and counting the number of bees working blooms during a 1-minute period. Take this count on a minimum of 10 trees when there is little wind and temperatures are 65°F or higher. Average the counts to obtain the mean number of bees per tree per minute. In mature orchards, there should be 20-25 bees on apples trees, 10-15 bees on pear trees, and 25-35 bees on cherry trees. These numbers indicate that sufficient pollinators are present for proper pollination. The number of effective pollinators accomplishing pollination from a colony is rather small. The actual force from a colony of 20,000 bees pollinating in Red Delicious apples, for example, is roughly 4,000. 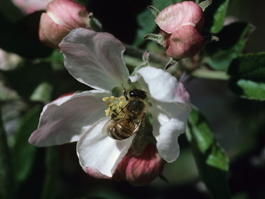 Many recommendations for orchard pollination call for one or more two-story colonies per acre. The strength of these colonies, however, can vary anywhere from 3,000 to 40,000 individuals. To be an effective pollinating unit, a colony should contain a minimum of 20,000 bees. Week (low-population) colonies are of little or no value for tree fruit pollination because they provide a lower proportion of field bees than strong colonies. Colonies should be housed in a minimum of two hive bodies. One-story colonies do not contain enough space to adequately house 20,000 or more bees. Flight activity in front of all hives should be nearly equal. This indicates uniform-strength colonies. There should be at least 75 bees per minute entering each hive entrance under warm (65?F or warmer), sunny conditions. Ask the beekeeper to randomly open some hives and look at the brood and bees yourself. Good beekeepers are more than willing to do this, if time permits. Many states regulate the size and general condition of colonies used for pollination rentals. A general rule is that a colony having 6 frames of brood with "bees to cover" will have a population of 20,000 adult bees. This is the minimum size an orchardist should accept for apple pollination. A two-story colony with at least 20,000 bees will normally provide adequate pollination for an acre of tree fruit. Although one colony per acre may be sufficient during most years, it may not provide enough bees during a cold, wet spring when weather Bee hives placed in orchard (E. Beers) conditions provide for only a limited amount of bee foraging. Therefore, we suggest the use of two colonies per acre to be sure that adequate numbers of pollinators are present even during poor weather. Intensive plantings of dwarf fruit trees with large numbers of blooms are usually stocked with at least two colonies per acre to ensure good production. For pollination of sweet cherries and other early blooming fruits colonies should contain at least four frames of brood by early spring. Colonies don't need to be uniformly distributed throughout the orchard to achieve best pollination results. 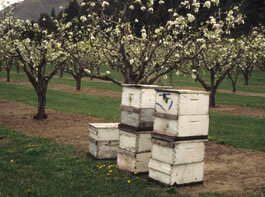 Cross-pollination in an orchard is more efficient when bee colonies are grouped together. Individual honeybees tend to remain constant to and forage on one or two particular tree(s) during a number of visits. This tendency is disrupted by placing colonies in groups and creating a high degree of competition. Bees disturbed by other bees shift to different trees. 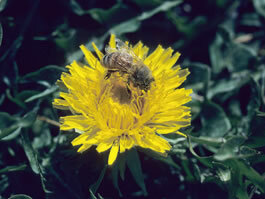 Competition increases the chances individual bees will visit both pollinizer and main variety. Experiments have shown that the best results are obtained with hives placed in groups of 4-6 at 150-yard intervals. This may be impractical in large orchards, where colonies should be placed in groups of 8-16 at 200- to 300-yard intervals throughout the orchard, starting about 100 yard from the edges. Young trees, with lower numbers of blooms, may be less attractive to bees than older trees and require closer grouping of colonies. Place colonies in sunny locations, never directly under trees in the shade. Colonies placed in warm, sunny locations, protected from the wind, and receiving early morning sun will have 50% more flight activity than shaded colonies. It is more important for the colonies to be protected and in sunlight than directly in the orchard. Orchardists should not select low spots in the orchard for colony placement. These are likely to be frost pockets, which will retard bee flight during cold, wet springs. Provide wind protection by using windbreaks rather than low sites. See that there is a source of fresh, uncontaminated water within one-quarter mile of the orchard, or place containers of water near each group of colonies. Use burlap or wood floats to keep the bees from drowning. Move colonies into the orchard just as it is becoming "bee attractive." This means waiting until 10% bloom for most fruit crops. Colonies should be placed in apple orchards just as the first king bloom opens. The bees from colonies placed in orchards too early will tend to forage other plants even after the fruit bloom opens. Work in Oregon indicates that colonies may be placed in pear orchards as late as 50% bloom and still provide adequate pollination. Pear bloom is not especially attractive to honeybees because of the low sugar content of the nectar. Many other blooming plants are more attractive. Moving in additional colonies of new (naive) bees a week or so after the first will help to provide adequate pollinator densities. When sizable orchards contain a number of kinds of fruit, it is desirable to move colonies from the earlier stone fruits into the later pears and apples after the latter are in good bloom. This helps retain the bees in the later blooming blocks at the time they are needed. Such moves should be at least 1 mile to reduce confusion and homing of the foragers back to the original location. Control competing flowers to keep bees on the target crop. This may mean mowing or otherwise removing any flowering ground cover in the orchard. Establishing sod strips between the tree rows and keeping them free of weeds in an excellent way to remove competition. Many pyrethroid insecticides are also highly toxic to bees, but some pyrethroids (such as esfenvalerate and permethrin) are repellent to bees when used under arid conditions prevalent in eastern Washington, eastern Oregon, and Idaho. Most bee poisoning incidents occur when insecticides are applied to bee-pollinated crops or blooming weeds during the bloom period. Beekeeper-grower cooperation is the most effective way to reduce bee poisoning. The underlying cause of most bee poisoning incidents is a lack of awareness, rather than an intent to do harm. The pest control program nearly always can be modified so that little or no bee poisoning occurs, without undue cost or inconvenience to the grower. The orchardist should have the beekeeper remove the bees soon after petal fall begins to reduce the hazard of bee poisoning from pesticide sprays. *1. If temperature is below 50°F all day, then it is safe to spray at any time of day. *2. If temperature is above 50°F, do not spray until after 7 p.m.
*3. If temperature is above 50°F, do not spray until after 7 p.m., and stop spraying at 7 a.m. Suitable pollinizer varieties must be planted throughout the orchard in adequate numbers to provide pollen for all main-variety trees. The number and placement of pollinizer trees required for best pollination are largely determined by the foraging habits of honeybees. Most bees (98%) tend to work down tree rows in intensive plantings rather than cross the aisle spaces, and may only work 2 or 3 adjacent trees on a single foraging trip. Mayer, D.F. and J.D. Lunden. 1988. Foraging behavior of honey bees on Manchurian crabapple and Red Delicious apple. Journal of the Entomological Society of British Columbia 85: 67-71. Mayer, D.F., C.A. Johansen, and D.M. Burgett. 1986. Bee pollination of tree fruits. Pacific Northwest Extension Publication, PNW 0282. Mayer, D. 1983. Apple pollination. American Bee Journal 123: 272-273.